For Mother's Day my Mom and Grandma had me make them both of these dishes as their 'gift'. I had actually never cooked Mahi Mahi before but knew my Mom loved it so I looked up some recipes, considering what she already had in the house and settled on this one. As for the risotto, my Mom was more specific, saying she wanted, seared scallops with mushrooms, and leeks. Let's start with the Mahi Mahi. Mix everything but the fish in a bowl and then add the fish and let marinate for 20 minutes in the fridge. After that, heat some light olive oil (takes high heat better my Mom taught me) in a pan and then add the fish, skin down, without the marinade and let it brown until crispy before turning. I only turn anything once and after I turned it, I let the other side sear for a minute or so before adding the marinade and letting it cook and thicken until the fish was done. The recipe suggested cooking the fish first and the marinade separately probably to let the fish cook completely without rushing it or to properly thicken the sauce but I ignored or forgot this and it turned out great anyway. The sauce had an amazing flavor! Also check out Sasha's Mahi Mahi Fish Tacos with Mango Salsa. Start by sauteing the veggies in olive oil & white truffle oil until soft while heating the broth and then add the rice and the wine and continue to stir until the rice has absorbed most of the liquid. Then add the hot mushroom broth and stir until the rice absorbs it, maybe 1/2 a cup to a cup at a time until the rice is soft. Definitely taste it as you will know when it's done. It took around 45 minutes but we had it on the wrong burner to start without enough heat or it may have been quicker. Also we had a cup or so of broth left over but considering how much risotto we had left over, we will probably use it when re-heating. 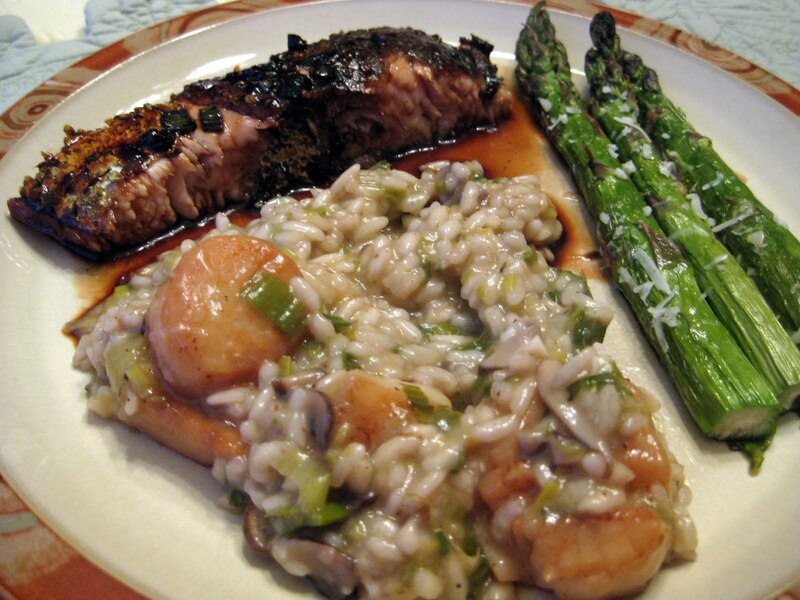 Here are a few other risotto recipes on this blog. It took about 4 rounds of searing the scallops while Jenn stirred the risotto until everything was done so we set aside the scallops until the end and then mixed it all together. Everything turned out very nicely and my Mom and Grandma were both very happy! Now if I can only get them to read my blog entries!